Santa is one of the few who can pull off a Profile like this!! Santa is assertive and runs a thriving toy empire (not to mention, he also runs the North Pole!) but he also loves stability because he’s had the same job since the beginning of time! Santa is all about the relationship, but also quite factual, i.e., you're either naughty or nice! He is flexibly paced, flying all over the world with no discernable route, speedily delivering millions of presents in one evening! Yet methodical, working all year long, building toys in his factory in an incredibly structured manner with strict quality parameters! Finally, while he does run the Santa Claus company and has to make many decisions, he’s completely perfect in his work. Every list is checked twice for accuracy and he’s never given the wrong gift to any child! Bottom line – Santa has the perfect mix of every trait, which is why he is loved by everyone! 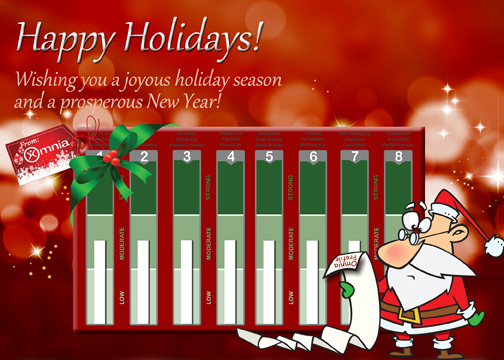 Happy Holidays from all your friends at The Omnia Group!